Here is my January portfolio growth. 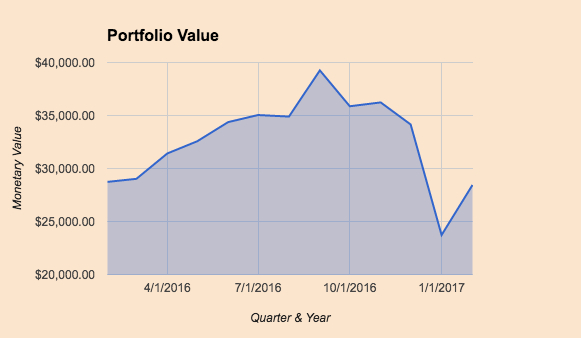 My portfolio value grew from $23,723 from 1/1/17 to 28,448 on 2/2/17. Pretty choppy graph of my portfolio value since I started the blog. The dip was due to me selling the majority of my FUSEX mutual fund and reallocating some of the money to invest in Fundrise (which I should update to show in my portfolio). Kind of regretting that right now as I figured I would quickly get to repurchase it cheaper. Also wanted to lock in some taxable gains for the year in 2016 vs potentially in 2017. Hope to get in at a good price, until then will continue to invest $200 a month into the fund. In the future, I won't do this at such a big hit to my portfolio. I invested $4,105.95 in January and the rest of the growth ($619.05) is due to appreciation. Congrats on adding over $4k of new investments last month! Looks like good progress to me once the FundRise investment is added back into the portfolio value. If I sell an investment in my portfolio, it simply increases the amount of cash in the portfolio until I make another purchase, so the overall portfolio value doesn't drop. You should include the FundRise investments in your numbers so you won't see such large dips. Thank you for stopping by. That's a good point, I need to include the Fundrise investment into my portfolio value; however, I never actually included it in the value - the dip was due to me selling FUSEX. I would LOVE to hear more about your FundRise experience! I've been looking at them for awhile, but there's the minimum $1,000 investment. Please share! Thanks! Yeah the minimum is quite high - let's see how our first full year goes. Love the concept, hoping it follows through. Thank you! not all savings some was just reinvested from a sale!